At its most recent commencement ceremony, May 17, Georgetown awarded an honorary doctor of laws degree to Paz y Paz. Last year, soon after failing to win a second term in office, Paz y Paz was welcomed as a scholar in residence at Georgetown, with a joint appointment at the Law Center and the Institute for Women, Peace and Security. Anyone wanting to gain a perspective of Georgetown and Paz y Paz would do well to start with those two items: the citation by Forbes, and the human-rights award. The Georgetown Institute for Women, Peace and Security was launched in December 2011 by Hillary Clinton as its honorary founding director. The citation in Forbes was arranged by Ambassador Melanne Verveer, who worked for Clinton as the US envoy for women’s issues and also became the Georgetown institute’s executive director. Clinton spent much of her term as secretary of state promoting Paz y Paz and her agenda. Georgetown, then, was bragging about an award to Paz y Paz that two of its own directors had engineered. The university might have found a more graceful way to pat itself on the back. The alleged crime took place in the early 1980s, at the height of a 36-year internal conflict that came close to destroying the country. Genocide: if the CJA want to claim that genocide occurred in Guatemala, they must first rewrite the dictionary, as well as history. Other people have tried to do so, but the word “genocide” and the facts of history have so far proved to be bigger than they are. Paz y Paz’s Justice Ministry did obtain a conviction of Ríos Montt in 2013 on the charge of genocide. However, that conviction was rapidly overturned for irregularities in the trial — major ones, far beyond technicalities. A new trial is in process. For now, the value of the genocide case as a precedent is nil. If the case were to triumph as the result of a political or judicial fix, as often happens in Guatemala, its value would be negative. The figure 200,000 has nothing to do with the case against Ríos Montt. 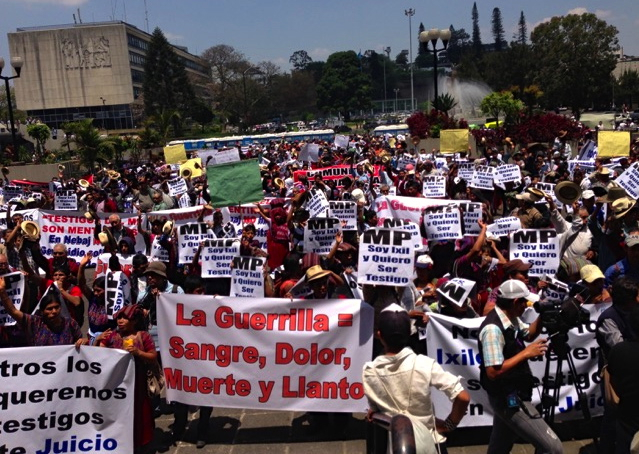 It is the figure widely, and rather dubiously, cited for the total number of deaths everywhere in Guatemala stemming from the 36-year conflict. Its use in reference to the Ríos Montt case is pure misinformation. So, too, is the word “Mayans.” The Mayans were an ancient tribe that went the way of the biblical Hebrews. Today the name is used as a rallying-cry; it is polemical, not descriptive. Here is the readily available factual truth concerning these matters: at his trial, Ríos Montt was accused in the deaths of 1,771 Ixils. That’s less than one-hundredth of the number used by the CJA, and another tribe to boot. The Ixils, descendants of the Mayans, are an indigenous people who live in northwest Guatemala. Another layer of fact: many Ixils are supporters of Ríos Montt. Outside the courtroom in which Ríos Montt was convicted, large numbers of Ixils came from far and wide to demonstrate on his behalf. And a proposition: if Ríos Montt had actually committed genocide, those massive gatherings of Ixils would have been the same as crowds of Hebrews — excuse us, of Jews — defending Hitler. In the global scheme, the CJA and its mistakes are a trifle; but not so the dissemination of those errors by a world-class educational institution. In celebrating Paz y Paz’s record, Georgetown gave its imprimatur to the misstatements and spread them to the four corners. As it happens, Georgetown has done the same thing with its treatment of Paz y Paz and her legacy. In parallel, the US State Department, beginning with Hillary Clinton, has given substantial help to Paz y Paz and has fostered policies that invite chaos throughout the hemisphere. It’s time for a good look at the Paz y Paz record — the kind of look that Georgetown University, and US officials, would probably prefer you didn’t get.